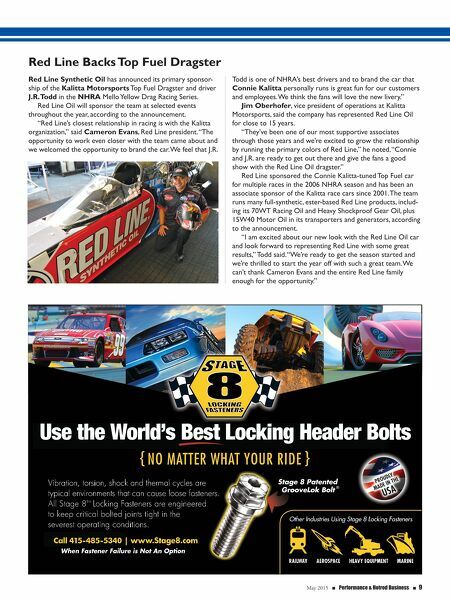 8 n Performance & Hotrod Business n May 2015 n Performance news What's new with you? Mail your news items to Performance News at Performance & Hotrod Business Magazine, PO Box 1416, Broomfield, CO 80038; fax us at (303) 469-5730; or email pbeditor@nbm.com. Stage 8 Celebrates 30 Years This year marks Stage 8 Locking Fasteners' 30th anniversary of building unique locking fasteners for a myriad of industries including the automotive, industrial, railroad and military markets. "Since 1985, Stage 8 has consistently delivered measurable increases in equip- ment reliability and safety, as well as dramatic reductions in maintenance costs and equip- ment failures, especially for the most critical fastener applications," the company said in a press release. It's estimated that over the past 30 years, Stage 8 has installed more than 17 million locking systems, without a single reported failure. Bruce Bennett founded Stage 8 after the bolt holding the header of his Harley- Davidson Shovelhead kept failing. He discov- ered a simple-but-innovative fix: lay a locking wrench, called a retainer, onto a grooved head of a bolt, which will lock it down and prevent it from working loose when the machine vibrates or when the metal heats and cools, the company stated. After seven failed designs, Bennett per- fected his idea and Stage 8 was born. "We look forward to continuing to pro- vide the industries we serve with the best, most reliable technology and second-to-none customer service for the next 30 years and beyond," said Robert Ahern. Stage 8 currently has more than 78 pat- ents and trademarks, issued or applied for. 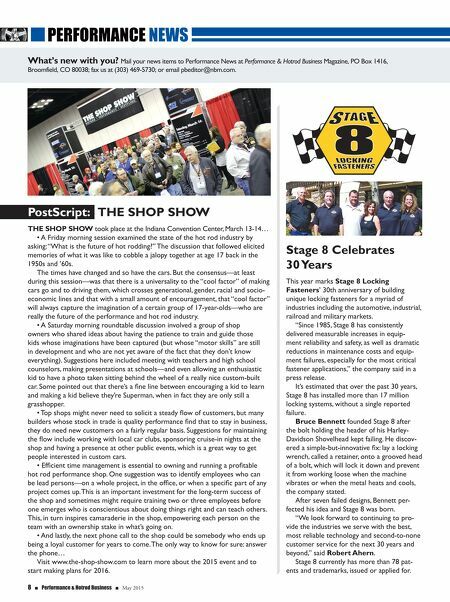 PostScript: THE SHOP SHOW THE SHOP SHOW took place at the Indiana Convention Center, March 13-14… • A Friday morning session examined the state of the hot rod industry by asking: "What is the future of hot rodding?" The discussion that followed elicited memories of what it was like to cobble a jalopy together at age 17 back in the 1950s and '60s. The times have changed and so have the cars. But the consensus—at least during this session—was that there is a universality to the "cool factor" of making cars go and to driving them, which crosses generational, gender, racial and socio- economic lines and that with a small amount of encouragement, that "cool factor" will always capture the imagination of a certain group of 17-year-olds—who are really the future of the performance and hot rod industry. • A Saturday morning roundtable discussion involved a group of shop owners who shared ideas about having the patience to train and guide those kids whose imaginations have been captured (but whose "motor skills" are still in development and who are not yet aware of the fact that they don't know everything). Suggestions here included meeting with teachers and high school counselors, making presentations at schools—and even allowing an enthusiastic kid to have a photo taken sitting behind the wheel of a really nice custom-built car. Some pointed out that there's a fine line between encouraging a kid to learn and making a kid believe they're Superman, when in fact they are only still a grasshopper. • Top shops might never need to solicit a steady flow of customers, but many builders whose stock in trade is quality performance find that to stay in business, they do need new customers on a fairly regular basis. Suggestions for maintaining the flow include working with local car clubs, sponsoring cruise-in nights at the shop and having a presence at other public events, which is a great way to get people interested in custom cars. • Efficient time management is essential to owning and running a profitable hot rod performance shop. One suggestion was to identify employees who can be lead persons—on a whole project, in the office, or when a specific part of any project comes up. This is an important investment for the long-term success of the shop and sometimes might require training two or three employees before one emerges who is conscientious about doing things right and can teach others. This, in turn inspires camaraderie in the shop, empowering each person on the team with an ownership stake in what's going on. • And lastly, the next phone call to the shop could be somebody who ends up being a loyal customer for years to come. The only way to know for sure: answer the phone… Visit www.the-shop-show.com to learn more about the 2015 event and to start making plans for 2016.